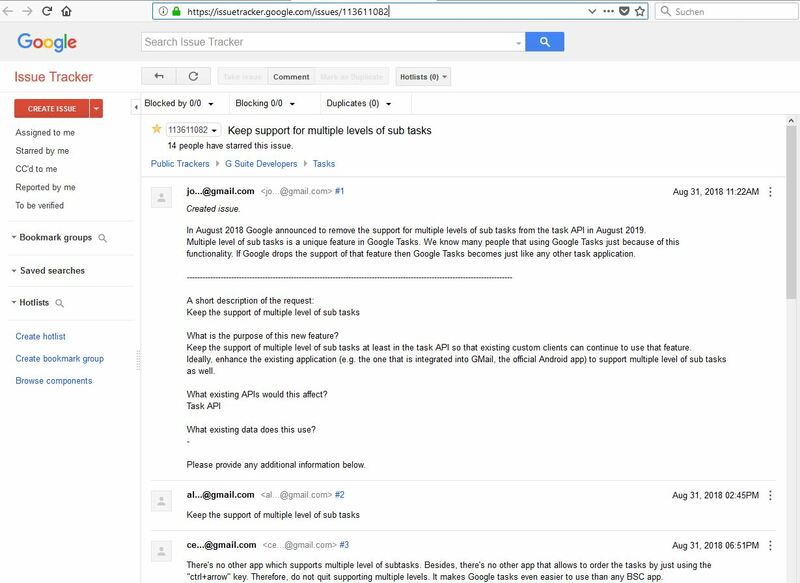 In August 2018 Google sent a mail to all developers using the Google Tasks API in their Apps. Google announced to restrict Tasks to only 2 levels starting in August 2019. Google already restricted the number of levels in their Android Tasks App and in Gmail. They will add the restriction to the interface to Tasks, which other Apps can use. This will affect Outliner's Google Tasks synchronization. Local Outlines or Outlines synced via Dropbox can use multiple levels also in future. However, in an upcoming update in spring 2019, Outliner will ask you (only for Google Tasks synced Outlines) if you want to flatten your Google Tasks Outline or if you want to make it a local Outline and keep multiple levels. If you are fine with only two levels, Outliner's Google Tasks synchronization will also work in future. If you need more levels, you should change to Dropbox synchronization (Config Outline). If you choose Treeline Dropbox sync you can use a free open source desktop Outliner. I know, that's bad news - so, is there anything we can do? There already is an issue posted in Google's Bug Tracking system. If you think that Google should keep multilevel support, you should post a comment where you tell Google why you think that they should keep supporting multilevel tasks also in future. With the recent update to Google Tasks, we limited the number of nested tasks a user could create to one level i.e. a sub-task. Sub-tasks are supported, but any nested tasks beyond these (e.g. sub-sub-tasks and so on) are no longer available in the product. Starting August 30, 2019, we will introduce the same structure in the Tasks API. This means that, as of that date, tasks that are nested beyond more than one level will no longer be supported. For example, if a user has double nested tasks (sub-sub tasks), the revised method of the Tasks API will convert it to a sub-task and return it as such. Please check and update your applications accordingly if they include multiple levels of subtasks.